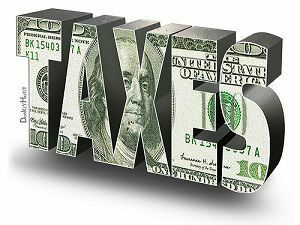 Home » Taxes » What Income Do You Need to Report to the IRS? One of the realities of earning more money is that you also need to report that income to the IRS. When you have a side hustle, you are supposed to report that income — no matter how insignificant it seems to you. Your income is reported on your tax return, usually using Form 1040. Additionally, if you have a separate business (i.e., a corporation or an LLC), you need to file a business tax return detailing your income from your business activities. Figuring out what income you are supposed to report is usually fairly easy: you are supposed to report all of it. There are those who claim that if you make less than $400 on your side project, you don’t have to report the income. While this is a nice thought, it isn’t exactly accurate. The reason this thought has come up is due to the fact that the IRS won’t require you to pay self-employed taxes on your self-employed income unless it reaches $400. This isn’t the case. The IRS expects you to report all of your income, even if you don’t have to pay taxes on it. You report the income, and if it ends up being less than what you are taxed on, you don’t pay your taxes on it. However, your money still contributes to your overall income, even if you aren’t paying self-employment tax on it, so the IRS wants to know about even the small amounts of money from your side hustle. Others insist that you don’t need to worry about amounts under $600, because those you do work for don’t have to issue a 1099-MISC unless you are paid at least that amount. Others assume that if they don’t get a copy of a 1099-MISC from a client, it means that they don’t have to report that income. That’s not the case, either. The IRS still wants to know about your income, and, even if you don’t receive a copy of your 1099-MISC, it doesn’t mean that your client hasn’t sent a copy to the IRS. In the end, you are better off reporting the income. Your income is reported using various tax forms, and it’s important to understand that different types of income might be taxed differently. A good example is long-term capital gains. When you hold an investment for more than a year, and then sell it at a profit, the gain is considered long-term — and it is taxed at a different rate than your regular income. In fact, depending on your tax bracket, your long-term capital gains might be taxed at a lower rate than your other income. Other income that you receive, including dividends from stocks that you hold, as well as short-term capital gains, are also taxed. You are also supposed to report income from interest, as well as passive income that you might receive from rental properties or a business that you own (but don’t participate “materially” in). All of this income is treated differently, and reported differently, affecting your tax liability. What about Yard Sale Income? Questions about whether or not to report income from a yard sale, or sales on eBay also abound. Technically, though, few of us make a profit when we sell our stuff. It’s one thing if you are selling stuff for others and taking a commission, and quite another if you are selling sporting equipment for 50% of what you originally paid. In those cases, you aren’t making a profit, so you aren’t seeing income. If you are making a profit, though, you are expected to report your gain. Most people, though, unless they actually run a business based on selling items, don’t see profits from selling on eBay. If you do run a business for profit, though, you should report your income. And you should be aware that the new Form 1099-K might be issued to you if you have made at least $20,000 over the course of 200 transactions. The IRS expects you to be honest about your income, and your profits. You are supposed to report that information. If you have questions about what type of income you have, or how to report it, consult with your accountant, or a knowledgeable tax professional. On what line of Form 1040 are non-taxable dividends reported on. While there is a line for Tax Free Interest, I do not find a line for Tax Free Dividends. How is Tax Free Dividends handles? I do not have to claim income from many investments because I hold them in my TFSA (tax free savings account). It is something the Canadian government wants all citizens to use to encourage savings. Unfortunatly most of us don’t use it and we pay taxes on dividends when we don’t have to. I like to be honest in my life so I claim what I have to even though many people do not.